Serve your family a wholesome oven-cooked meal, without breaking the bank. Tasty and affordable oven-bag recipes created especially for you from the experts at Reynolds Kitchens. 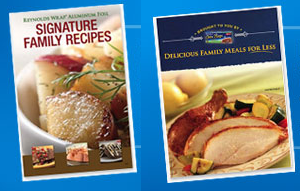 The Delicious Family Meals for Less is a great money-saving cookbook. PLUS: Signature Family Recipes - Delicious home-cooked meals for your family that are specially designed for today's busy cook. PLUS: Coupons for Reynolds Wrap - $1.00 off Parchment Paper - $0.75 off Oven Bags - $0.75 off Aluminum Foil - $0.75 off Slow Cooker Liners - $0.75 off Heavy-Duty 18" Foil.